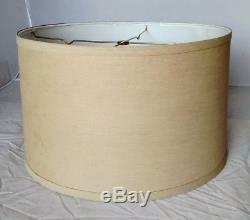 Elegant smooth weave khaki tan linen fabric drum shade with durable white hardback liner is USA American made! Very Limited Quantity Left To Sell. This material is no longer available. See the green table lamp (not included) which shows the versatile khaki tan shade color which can be used in a wide variety of decor themes. Standard Spider Fitter: Spokes are recessed 1/2 below the shade top, fits on any harp, glass reflector bowl or shade holder. Since 1975 - Customer service is our # 1 priority. The item "Khaki Tan Linen Drum Lamp Shade 20W USA American Made" is in sale since Monday, March 26, 2018. This item is in the category "Home & Garden\Lamps, Lighting & Ceiling Fans\Lamp Shades". The seller is "lampdoc0123" and is located in 28092. This item can be shipped worldwide.